Dr. Risheng Wang, assistant professor of chemistry, has received a $350,000 grant from the National Science Foundation’s Division of Computing and Communications Foundation. The grant allows her to continue her research with DNA origami nanostructures, now focusing on microelectronics. Wang’s goal is to use single molecules as the main building blocks for creating functional electronic circuitry. The new, bottom-up methods that Wang will use would create metal electrode junctions using templates of synthetic DNA origami nanostructures. This method will open the door to fabricate scalable and cost-effective metallic electrodes in a single reaction and to incorporate multiple single-molecule components in parallel, which is key to fabricating multiple devices containing single molecules. 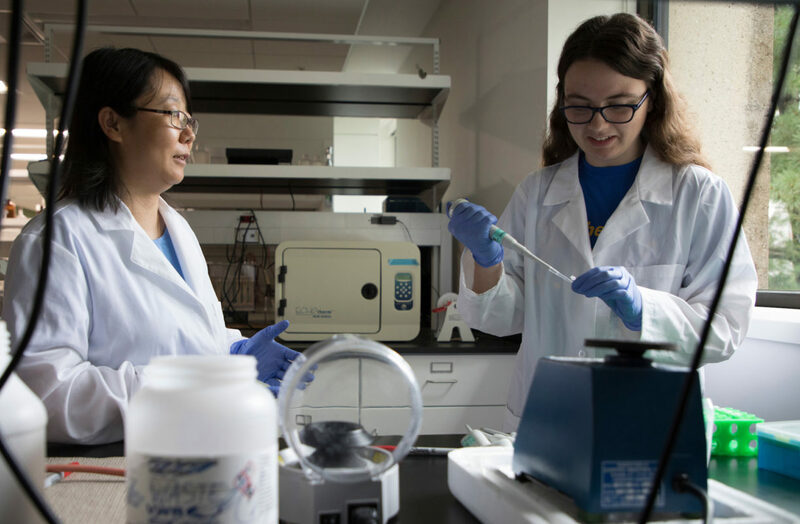 Wang’s grant project will provide interdisciplinary training to graduate, undergraduate and high school students crossing the fields of biochemistry, material science, nanotechnology and nanofabrication. Read the abstract.